Alongside the 2009 SPSS Mare and Stallion Gradings, on the 10th October 2009, an In-Hand Premium Show was held for the fourth time. 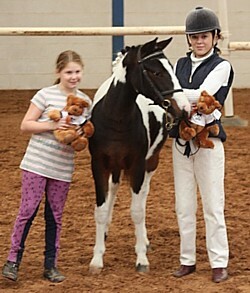 The event took place at Heart of England Equestrian Centre by kind permission of the Ballantyne family. The Judge for the 2009 In-Hand Show was Lynne Crowden and the Supreme Champion was the 9 week old foal Godrics Campeggio who was bred by her owner Sam Brown and is by the SPSS Elite sire Caesar 171 out of Bernwode Mandy. Reserve Champion was the 3 year old pony, Mademoiselle, who had earlier been the 2009 Mare Grading Champion. Mademoiselle was bred by her owner, Ben St John James and is by the SPSS sire Bernwode Brokat out of the AES Jumping pony Utaura (by Aester Tsakka Dekota). 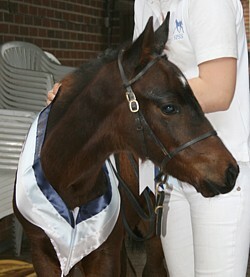 Class 2: Mares likely to breed a Sports Pony (Born in 2005 or before). rider and their SPSS teddies! !